When harvesting broccoli, timing is important. You want to let the heads grow as large as possible, but harvest while the heads are still tight, before the florets swell. The flowers should be tight beads. This head is about 1 day past prime. Heads like this one should be eaten within a couple of days. Heads harvested at the right time, with tighter flowers, can keep for a week or two in the vegetable crisper. Watch broccoli heads that are close to harvest carefully. In warm weather, florets can swell and start to open quickly. 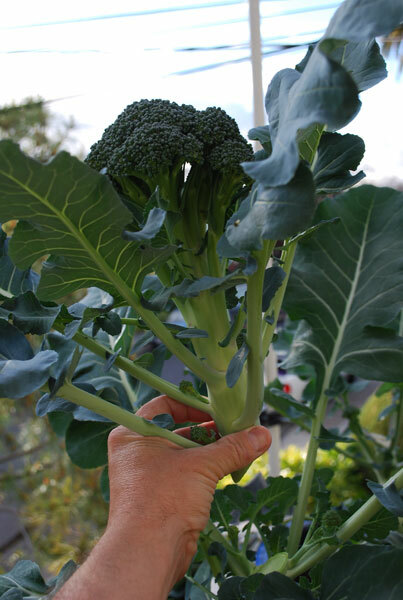 Most broccoli varieties will produce a second crop of side shoots and tender leaves a few weeks after the main head is harvested. 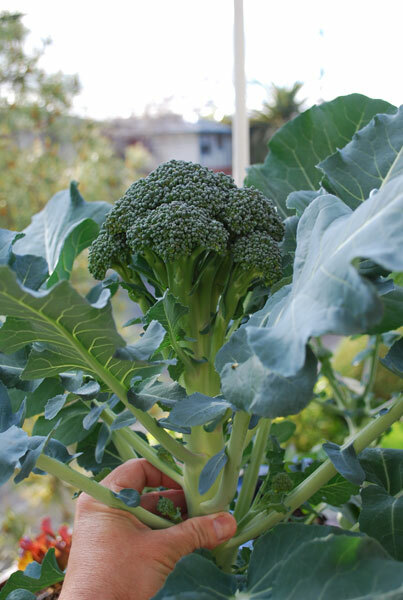 To harvest broccoli, use a sharp knife to cut the head off at an angle, above a whirl of leaves. 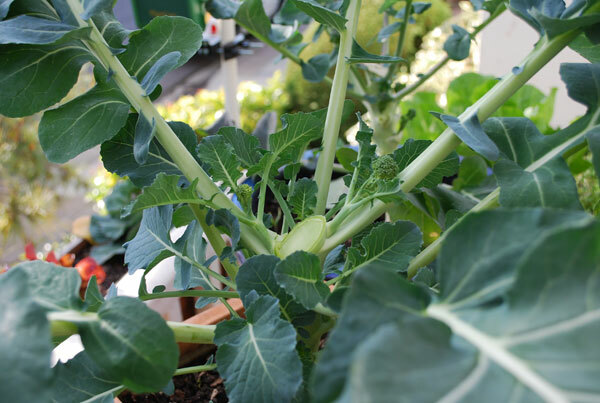 Small side shoots like miniature heads of broccoli will sprout from the leaf junctions, and can be harvested in about 2 weeks. The upper leaves of broccoli are also tender and delicious, softer and sweeter than kale, if you cut the midribs out. 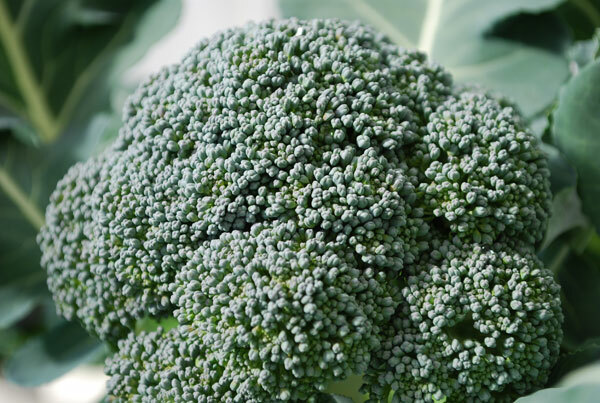 They can be steamed and eaten like kale, or sauteed with garlic, as in the recipe below. 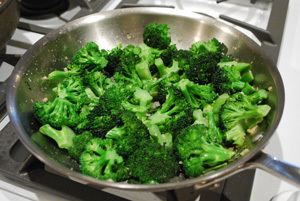 This recipe is a simple, quick way to prepare broccoli. Use the stems for this recipe, not just the florets. Peel the garlic cloves, and mince. The allicin compounds that make garlic so healthy for us develop after cutting, on exposure to oxygen. Letting chopped garlic sit for 10 minutes develops the maximum allicin levels, so I always mince garlic first, and let it sit while I chop other vegetables. Cut the florets off where they join the main stem. 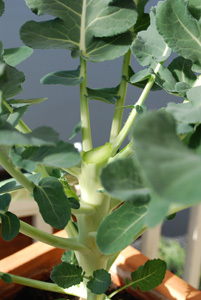 If the broccoli has been sitting in the fridge for a few days, cut the bottom 1” (2.5 cm) of stem from the base of each stalk. Peel the stalks with a paring knife, if the skins are tough and fibrous. When done, cut the stems into diagonal cross-sections about 1” (2.5 cm) thick. Separate the florets by cutting them off with a chef’s knife. Heat the olive oil in a heavy stainless steel or cast iron skillet. Add the garlic, stir, and turn the heat down to medium. Saute for 1-2 minutes, stirring occasionally to keep it from browning. Add the chopped broccoli stalks, and continue sauteeing for 2 minutes, stirring occasionally. Add the florets, salt, and pepper, and stir for another 2 minutes. Pour ¼ cup of water or stock into the pan, cover, and turn the heat to low. Allow to steam for a minute or two, then transfer to a serving dish. 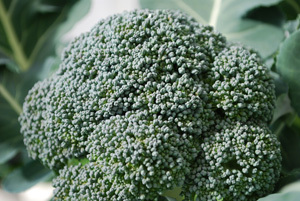 The broccoli should be crisp-tender, and a vibrant green color. If you cook it too long it goes olive-drab and turns mushy and sulfurous, so make sure you don’t cook it too long.